We supply a wide range of high-level window cleaning services to a variety of commercial and industrial customers including major shopping centres, airports, sporting venues, hotels, military sites, universities and industrial buildings. 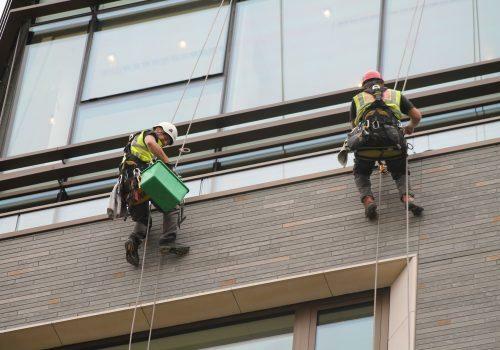 With an emphasis on safety, reliability and cost effectiveness, our background in the maintenance, installation and testing of equipment for working at heights means that we can offer a complete package of high level window cleaning services. Our teams are highly skilled in the use of a range of equipment including rope access/abseiling techniques, BMU access, MEWPs and ladder work, allowing us to carry out full cleans at even the most challenging sites.